Private vs. Public Cloud vs. Hybrid – What’s the Difference? More and more organizations today are deploying cloud-based solutions to help simplify complex IT architectures and to drive down IT spending. In fact, a study by MarketsandMarkets suggests that the hybrid cloud market is estimated to reach $91.74 billion by 2021 (Source: MarketsandMarkets). If your organization is considering a move to a cloud-based environment, it’s important to evaluate the different options available. A first step is to take a closer look at the differences between common cloud environments, including on-premise private cloud, public cloud, and the increasingly popular hybrid cloud option. With a solid understanding of each, enterprises can successfully leverage cloud architectures to meet new business goals and determine winning strategies for moving certain applications or servers to the cloud. Why on-premise private cloud? Private cloud environments can be configured to support nearly any application. However, running and operating a private cloud generally makes the most sense for legacy applications, I/O-intensive applications (i.e. HR, accounting systems) or for mission-critical applications with strict security requirements. Those compliance requirements might come from corporate standards (i.e. those required for a defense contractor) or they might be industry or government mandated. Often requirements outlined by the likes of HIPPA and PCI, make a strong case for an on-premise private cloud option. A private cloud, run through a virtual private network (VPN) offers organizations the ability to safeguard critical data from potential data leaks with minimum risk and maximum ROI. When evaluating VPN services such as Microsoft Azure, Amazon Web Services, or services offered by cloud providers, ask what your virtual network environment will look like. What network and endpoint protection is available to monitor file activity and provide security alerts? What malware is available? Can you create subnets and configure your own route tables and network gateways? If this level of management is too much for a small IT staff, consider how a cloud service provider can help streamline management and improve the reliability of the VPN. If an incremental approach is most prudent, ask if a pay-as-you-go cloud model is available to help with scalability and predictability of pricing. Why public cloud? The public cloud architecture is really the foundation of the cloud movement. In the public cloud environment, an organization gains access to pooled computing resources either from underlying physical servers or from a virtualized environment, across a public connection. This is generally called the Infrastructure-as-a-Service (IaaS) model because it allows organizations to establish infrastructures by leveraging foundational services like computing, storage, networking, and security infrastructure from a cloud provider. Often server space, network connections, bandwidth, IP addresses and load balancers are also delivered in this IaaS model. As a result, the cloud architecture helps organizations to improve business agility and achieve higher scalability to expand and contract as business needs change. This cloud scenario is also more secure and reliable in many ways because if one server or network switch fails, service levels are maintained because there are a multitude of hardware and software resources available. Often organizations select the public cloud environment for tasks such as long-term data storage, testing environments that need to scale up and down quickly, or new applications where demand is uncertain. 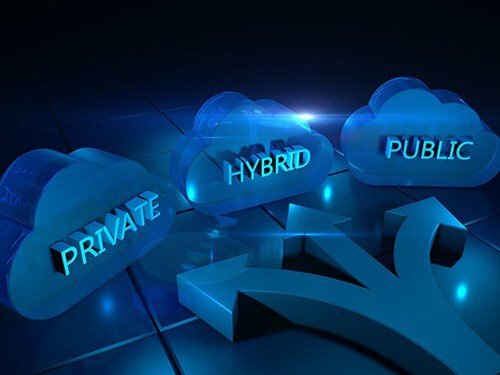 Why hybrid cloud? The beauty of the hybrid cloud is that it offers a balance between private and public cloud architectures. It allows the best of both worlds because an organization can run legacy applications in a stable and highly secure environment in a private cloud, with the option to reach out to the public cloud when needed. In a hybrid cloud environment companies also have access to on-demand resources from a shared pool, which gives ultimate flexibility to spin up resources. This could mean if an organization is mandated with compliance requirements, those highly encrypted servers could sit on-premise in a private cloud. Then, other applications are placed in a public cloud or hybrid environment to support variable workloads, such as application development, promotional applications that need to scale quickly or BI and analytics applications. This option is often suitable for organizations looking to streamline operations and to cut capital expenses (i.e. nixing costly hardware, software and maintenance investments). These organization also still require the scalability needed for SAN-based storage, disaster recovery and more. Cloud computing architectures like those offered from VMWare let users integrate on-premise infrastructure with public cloud deployments for the ability to move resources between multiple servers rapidly. Often when evaluating the pros and cons of cloud environments, the answer generally lies somewhere in the middle. Most organizations need the ability to increase computing, storage, and backup capacity, and manage new applications on the fly. With these needs, it makes perfect sense to virtualize some tiers of the application stack and migrate some applications to the cloud. On the other hand, most companies also require the security and reliability of a private on-premise cloud architecture to run certain parts of the business. If your organization is exploring different cloud models, consider an architecture’s ability to deliver the right balance of functionality, flexibility and investment protection.